I am supporting a petition to the Scottish Parliament calling for the Scottish Government to make it an immediate priority to ensure that all rural areas currently out of range of local broadband internet coverage are provided with a reliable superfast broadband internet service suitable for twenty-first century communication within the shortest possible timeframe. The petition has been submitted on behalf of Laid Grazings and Community Committee. Its purpose is to prioritise broadband installation for Laid and all rural areas who do not have broadband at present, at the earliest opportunity. Petitioner, Hugh MacLellan, states that it’s been submitted in the interests of growth in the Scottish economy as a whole, and with a view to boosting business opportunities and employment throughout Scotland. The village of Laid in North West Sutherland, like many rural areas, does not have broadband. A fibre optic cable laid three years ago runs through the village but petitioners state there are no plans at present to install an exchange system to enable the houses in the village to receive broadband. The NC 500 tourist route also runs through the village and petitioners say tourists are not prepared to stay in B&Bs as there is no acceptable broadband. After a local petition signed by residents of Laid and visitors who stayed in the area gained 750 signatures over summer 2017, the community decided to take their case to Parliament. They want to see broadband established not only in the village of Laid but in many other rural areas who are in a similar position. Having campaigned for over a decade to have broadband services improved throughout the Highlands and Islands, I welcome the Laid community’s drive and determination to seek improvement for their area. Like them, I believe many other rural areas will welcome the intention of this petition and I would encourage people from far and wide to support it. Mrs Grant continued “The Scottish Government has finally accepted that broadband is no longer just a nice thing to have, but is a necessity in today’s digital world, so let’s see them move a bit quicker to support our rural areas. I welcome the news that NHS Grampian have announced that applications for a new fast track Advanced Nurse Practitioner (ANP) course, the first in Scotland, will open this week. The bespoke course, which will be delivered by Robert Gordon University and the newly established Advanced Care Academy, will offer 20 places to nurses, with around half of the posts in the first intake being planned for Dr Gray’s. This is a positive move by NHS Grampian in bolstering their multidisciplinary workforce across the region, but more importantly at Dr Gray’s hospital, Elgin, where staff shortages in various Departments has been a very real issue. To see that at least half of the first intake of 20 ANP’s will go to Dr Gray’s will make a huge difference. However, we need to be clear that while Advanced Nurse Practitioners have a vital role to play, they are not a replacement for Doctors and we need to see greater recruitment and training of them as well. If this drive provides more sustainability to local services I would hope that other health boards look at this initiative. I heard how the GlenWyvis Distillery in Dingwall is just £70,000 short of its £750,000 open share offer when she visited the company last week. I represent Labour in the Highlands and Islands, was told how the first 100% community owned distillery is forging ahead with its gin and whisky production after being established just two years ago. I was encouraged to visit the venture because she is also a member of the Co-operative Party. It is so encouraging to see an ambitious community co-op taking off, especially in Dingwall where the last distillery closed in 1926. There are high hopes for more jobs to be created as the business develops and I wish them every success for the future. I was shown around the distillery by its Marketing and Tourism Strategy Officer, Michael Fraser, and Distillery Manager, Duncan Tait. 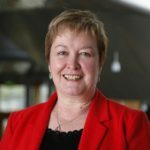 Highlands and Islands Labour MSP, Rhoda Grant, is frustrated to have it confirmed that there will be no facilities for women to serve their sentences in the new prison to be built in Inverness. Highland councillors recently approved planning permission in principle for the prison to be built on a site near Inverness Retail Park with building work understood to be due to start this year. Rhoda Grant said “The Scottish Prison Service has confirmed to me that future custodial arrangements for women from the north will remain as they are at present. Under current plans women will continue to serve their sentences in Peterhead. “This is unacceptable in the 21st century. Women offenders need to be accommodated closer to home to allow loved ones, particularly children, to visit easily. It is neither acceptable nor right that families in the north should have to travel these distances to visit. “I appreciate the old Inverness Prison is over 100 years old but the SPS needs to move with the times and come into this century.